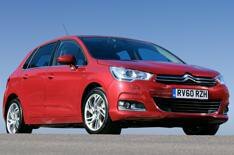 New Citroen C4 prices revealed | What Car? The new Citroen C4 range will cost from 15,595, the company has confirmed. Positioned to as a direct rival to the likes of the Ford Focus and Volkswagen Golf, the new C4 is available only as a five-door hatchback, with a choice of seven engines: three petrol units co-developed with BMW and four diesel engines. All diesel-engined models emit less than 130g/km of CO2 (qualifying for free road tax in the first year after registration), with the greenest model being the 1.6 e-HDi. This comes with a semi-automatic gearbox and an engine stop-start system, helping it achieve emissions of 109g/km. There will also be three trims to choose from VTR, VTR+ and Exclusive with the range-topping 2.0 HDi 150 Exclusive model costing 21,495. Equipment on the entry-level VTR includes six airbags, stability control, Hill Start Assist, air-conditioning, electric front windows, a six-speaker stereo and cruise control. Step up to VTR+ and you add alloy wheels, a leather-trimmed steering wheel, customisable colour instruments, front foglights with cornering function, rear parking sensors and Bluetooth. At the top of the range, Exclusive adds larger alloy wheels, part-leather upholstery, climate control, automatic headlamps and wipers, and front parking sensors. Also included are electric lumbar adjustment with massage function on both front seats and an electric parking brake. The range will be available to pre-order from November 22, with first deliveries expected in January 2011.